Like, who really owns trees anyway, y'know? RPS is having an Apocalypse Day! We’re celebrating the end of the world and games about it. Check back tomorrow, if we’re still all here. This is like one of those jokes that work on Twitter but makes people really concerned if you write it on Facebook: “Anyone else feel like the planet is doomed and we should stop trying?” Like, your aunt would post a comment underneath asking if you were okay. 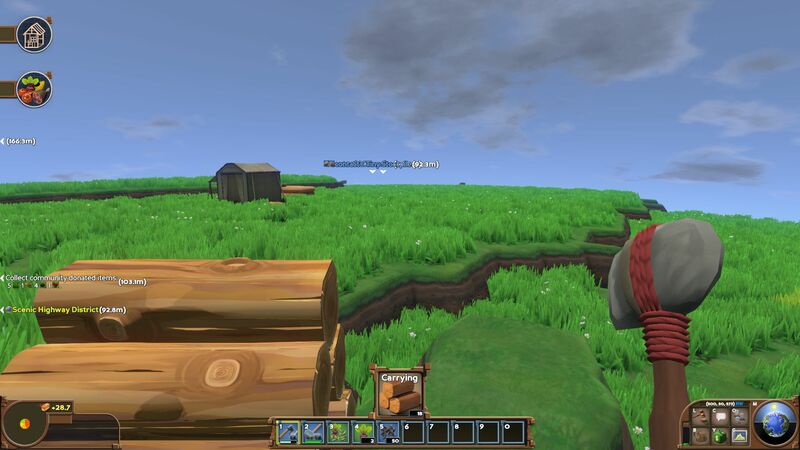 The first time I played Eco, I chose a world that had been running for a few days, with a few active players. It seemed like a good idea, because they’d have gotten a head start on stopping the meteor about to hit the planet, you see. I spawned in on a wide, flat plain with a few tents dotted around. The tutorial advised me to set up my camp near other buildings, so I’d be able to take advantage of what the community had built so far. I didn’t realise then that the plain I was on was once a thick forest carpeted with wild fruits and vegetables; the deforestation had been curbed by the introduction of a tax on anyone but new players cutting down trees. The camps around me had long since been abandoned for larger homes. The nearest trees to me were a slog away, and I barely managed to build anything. 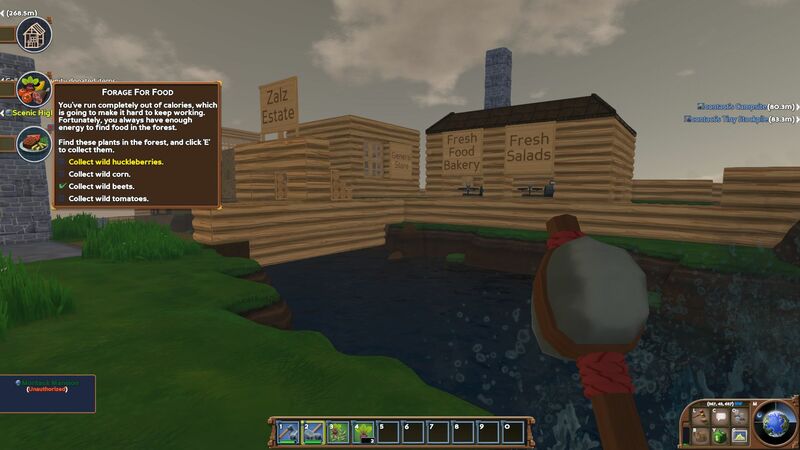 I got hungry and couldn’t complete the quest to find food, because the only edibles growing nearby were owned by another player who was now running a bakery. Seriously. This person owned the only living corn on the planet, I think. There was a forge, general stores, and a long stretch of a highway was under construction. Players were working together and showing each other what they’d built for the effort (a big path between different homes). 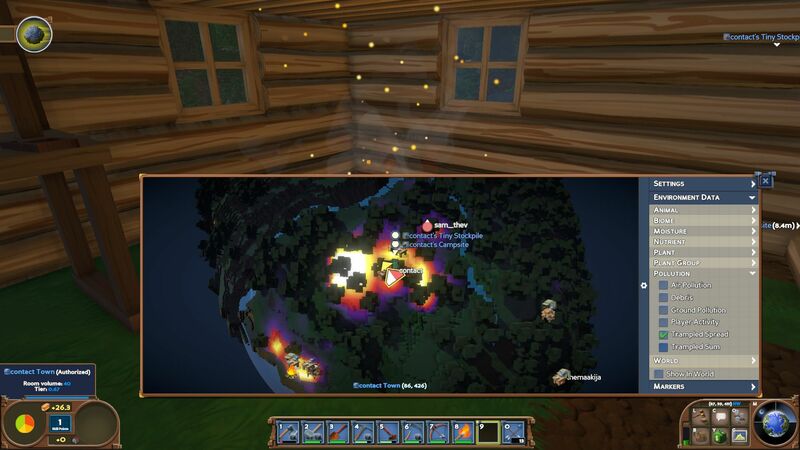 There are systems in the game that encourage collaboration and prevent griefing; you can set the ownership of any of your stuff, making it public, private or available to certain individuals. The server I was on was, unsurprisingly, not a communist one, but they did have a stockpile from which newcomers were allowed to take a certain amount of food to keep them going. There was very little forest near my camp, so I spent most of my time trekking back and forth carrying logs, and eventually built a small home. But then what? Almost everything else nearby was owned by someone else already. I’d have to move to the other side of the world to make more progress. And progress can be made, as evidenced by the business and homes other people owned. There were a couple of other people on the server, discussing what progress they had made in building. But they didn’t seem concerned about the meteor. The meteor felt, in fact, like a MacGuffin to force people to work together. 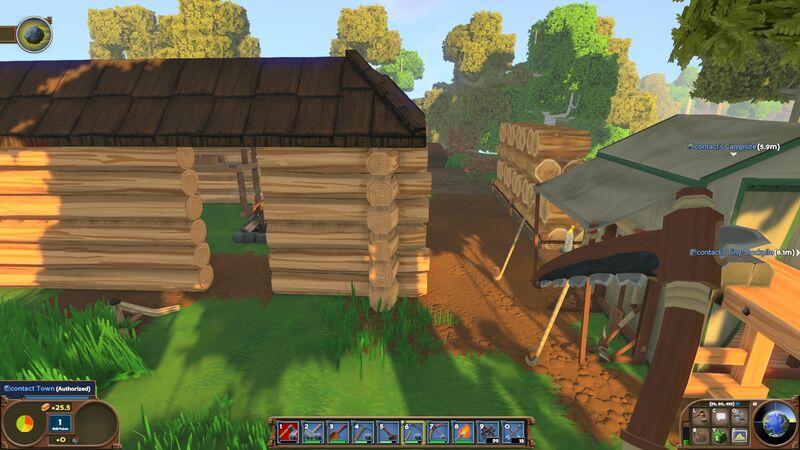 I switched ownership of my meagre pile of logs to public, and left for a new world. On a fresh, new planet in Eco, almost everywhere was forest. I built a small, one-room log cabin with an earth floor and a campfire inside, which I was using to roast some tomatoes. I’d tilled a small patch of ground behind it to make a vegetable garden from wild seeds I’d found in the forest, and had a storage stockpile to set aside more raw resources. Just a few logs to keep the fire burning, really. I was specialising in carpentry to be able to build better things — as in The Yawhg, I was a lonely woodcutter living in the woods. I made myself a bow, and managed to hunt an elk by myself — just the one, just for food to keep me going. All in all, things were going modestly, but well. The world of Eco is worth saving. It’s blocky, but varied and pretty, with a bunch of different biomes and animals. I went to the beach, and found a desert with flowering cactuses (cactiiiii?). 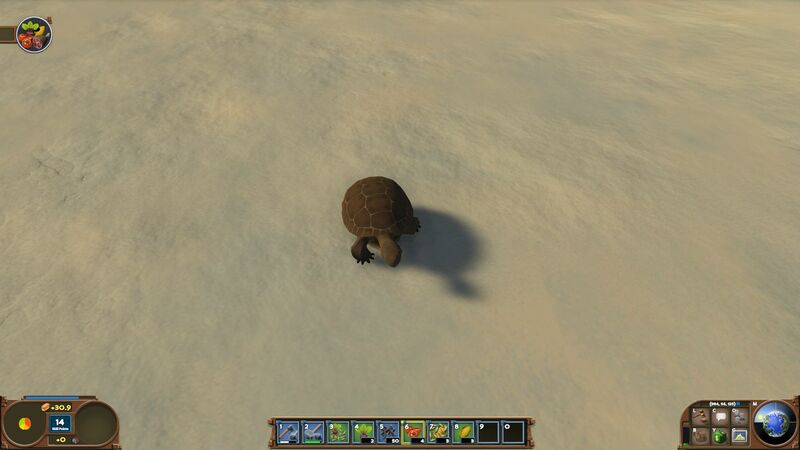 I found a lot of tortoises thriving on top of a snowy mountain, which was confusing and inspiring in equal measure. The forest where I put my cabin was very thick, and dark. I was next to a waterfall! I was looking forwards to learning to fish! Then I opened the map, and saw that my little homestead was the centre of a zone of one-woman destruction, glowing on the largely pristine surface like a pimple of shame on the face of a developing world. My tiny home had necessitated the destruction of a surprisingly large swathe of virgin forest. This had also left a lot of debris from where the trees had been crashing down, and my constant trekking back and forth had trampled a substantial area as well. I panicked, and started tidying everything up as if I’d forgotten I’d invited someone to my flat, which only increased the trampling. When I logged back in a day or so later, other people had moved in. Half the forest was gone, replaced by a crop of wood-and-glass skyscrapers. I could see stuffed elks displayed in the windows of one of them. I felt like the old man from Up. What happened to the forest? Seeing how much of the world can be consumed in just a couple of days is a bit scary, especially because you’re reminded that this is the most likely end of our world in real life. Even my little cabin had used up a lot of trees. Roasting my tomatoes used even more logs. But It made me a bit sad that I couldn’t just play it as a living-in-the-woods-peacefully-and-accepting-the-inevitable-end sim. After all, I hadn’t even existed on that game planet until I decided to arrive on it, at which point it was very important that I stop the meteor. The elk weren’t fussed about it. Getting rid of the trees seemed like a shame. And that’s the point, I suppose, I know it is; Eco is good at showing how much impact we can have on our environment. It’s just that it demonstrates it a bit too much, and the object of the game — cooperating with other players to balance saving the world with saving the world — feels like just as bleak an outcome as annihilation. I’d rather have been roasting a few tomatoes and cutting the grass on my dirt floor when it got too long, and welcoming the meteor.